Navin Chawla was educated at the Lawrence School, Sanawar, and went on to read History at St Stephens College, Delhi University. He took another degree in History at London University, and also obtained a diploma in Social Administration from the London School of Economics. Later, he was a visiting fellow at Queen Elizabeth House at Oxford University. He joined the IAS in 1969 and rose to become Secretary to the Government of India. He was appointed Election Commissioner in 2005 and Chief Election Commissioner in April 2009, when he conducted the General Elections in India in May 2009. During the course of his interesting and varied career, he met Mother Teresa in 1975 and remained closely associated with her till her death in 1997. Mother Teresa inspired him to take up the cause of the poor and marginalized, including the leprosy affected in India. 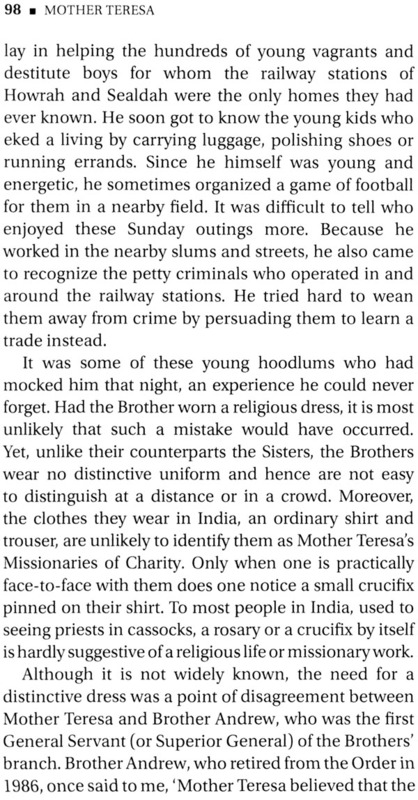 In 1997, he wrote a report on the leprosy situation in India, which, not surprisingly, was released by Mother Teresa herself in New Delhi in October 1997. Since then, the author has continued to espouse the cause of the disabled and leprosy affected in India. 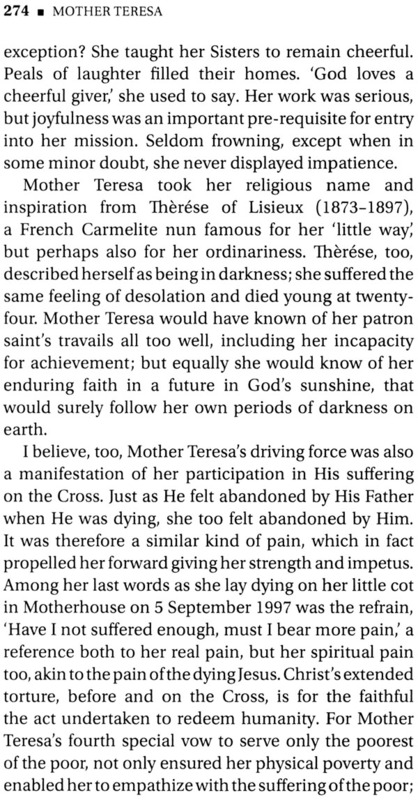 In 1992, he wrote this widely acknowledged biography of Mother Teresa, which has since been translated into fourteen languages and the proceeds of which go mainly to charity. He is married to the well known art conservator and writer Rupika Chawla. They have two daughters. 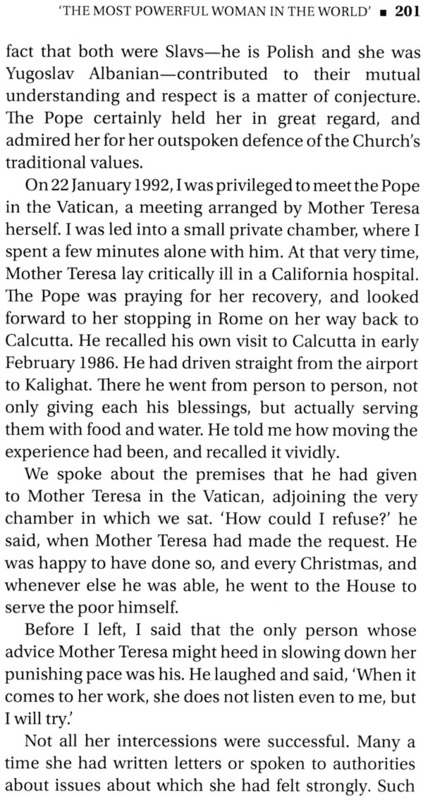 It was twenty-seven years ago in 1975 at a brief ceremony held in Nirmal Hriday-the Home for the Pure Heart-in Delhi, that I first met Mother Teresa. She had invited the Lieutenant Governor to inaugurate a small rehabilitation centre for elderly inmates as she was eager for Delhi hospitals to place an order for linen and gauze bandages from her tiny two-room unit. She knew that the approval of the head of the city's administration would go a long way to ensure employment for the dozen old people working on the looms. 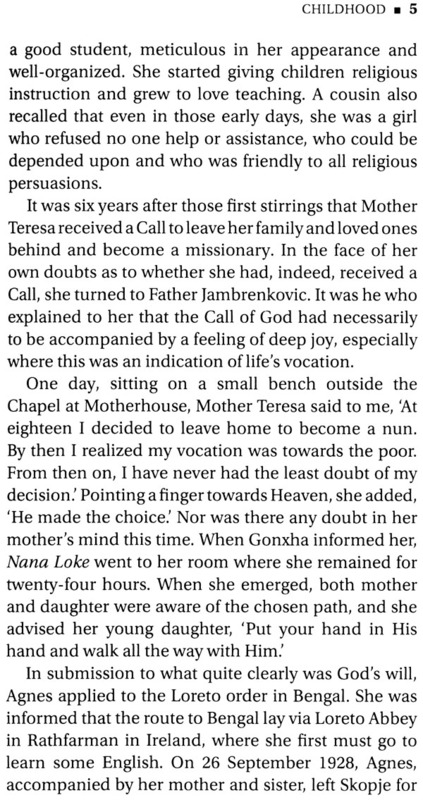 Although I seldom accompanied him on such occasions, I was curious to meet Mother Teresa, and so I went along. As part of my official functions, I had prepared a speech for the Lieutenant Governor to read out on the occasion. But after being taken around the rehabilitation centre and the two dormitories for homeless old people, who sat up in their cots and greeted us with such warmth and enthusiasm, I was all too glad that my stiff little speech remained in the Lieutenant Governor's pocket. For it was not a morning for prepared speeches. Mother Teresa spoke about simple things: about love, caring and sharing. She spoke about the new centre and little drops that in the end make the ocean. The Lieutenant Governor responded to her appeal with equal simplicity. 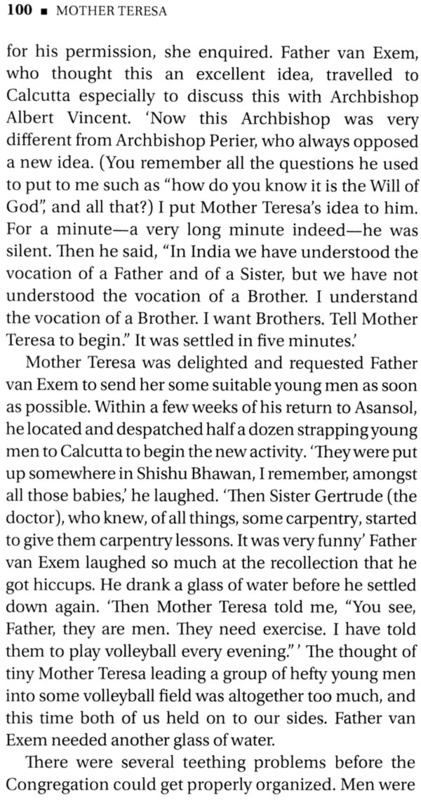 He assured Mother Teresa that the hospitals would purchase every last bedsheet, towel and bandage. 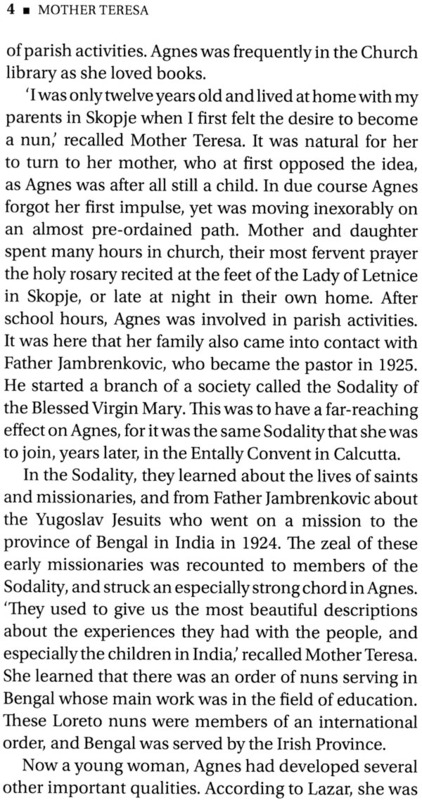 He also invited Mother Teresa and her Sisters to see him whenever they wished, even without an appointment. 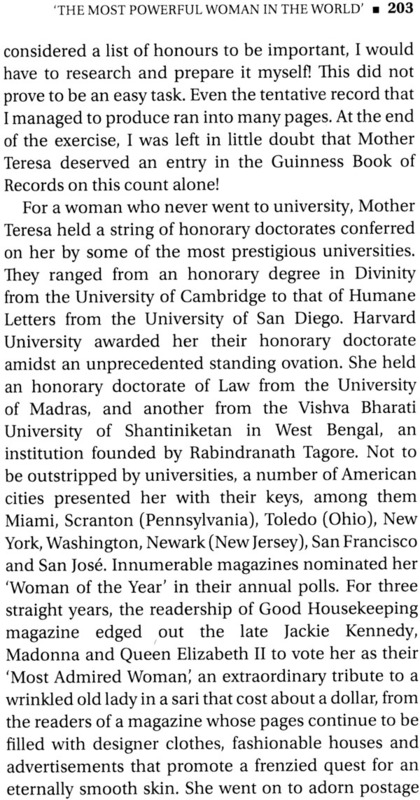 Mother Teresa was prompt in accepting the invitation. 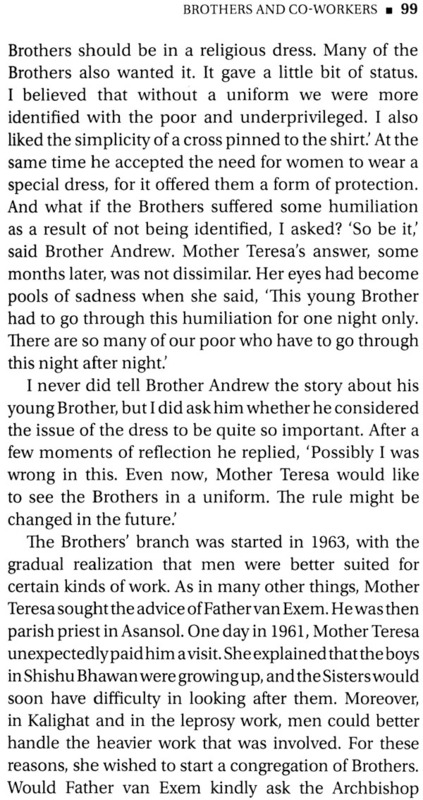 One morning not quite two weeks later, there was a knock on my door and Mother Teresa walked into my office. I was so taken aback that it took me a few moments to recover my equilibrium and to respond to this sari-clad nun's 'namaste, her hands folded in traditional Indian greeting. 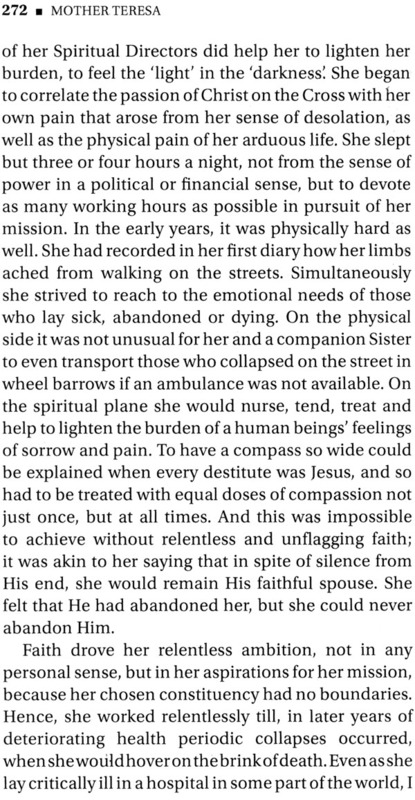 The problem that had brought Mother Teresa from Calcutta was one that most people shudder even to think about: leprosy. This was the meeting which marked the beginning of my involvement with her work. 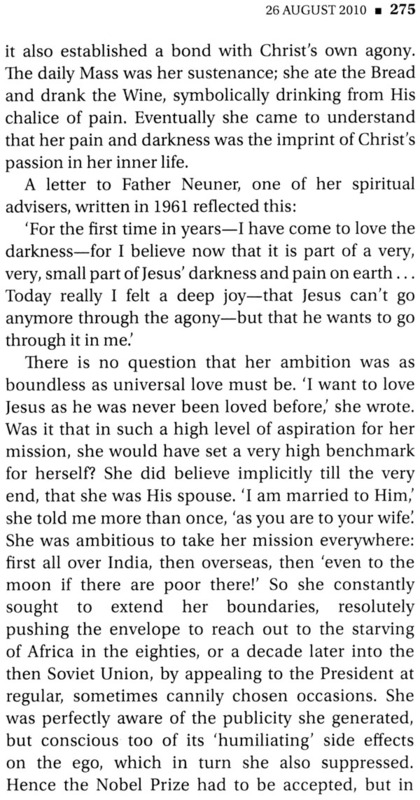 Mother Teresa, with what I was to soon discover was her usual manner, came straight to the point. I remember her words well. 'There are a number of persons affected by leprosy who migrate to the big cities seeking work or treatment. Many are not able to get help and have no alternative but to beg. 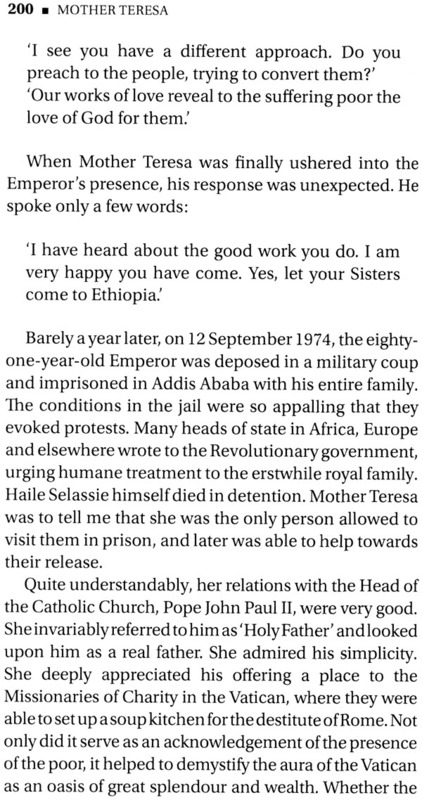 If we could be given four or five acres of land, we would start a treatment and rehabilitation centre for them: I requested Mother Teresa to wait a few moments and informed the Lieutenant Governor of her presence. He immediately received her and the two Sisters who accompanied her. 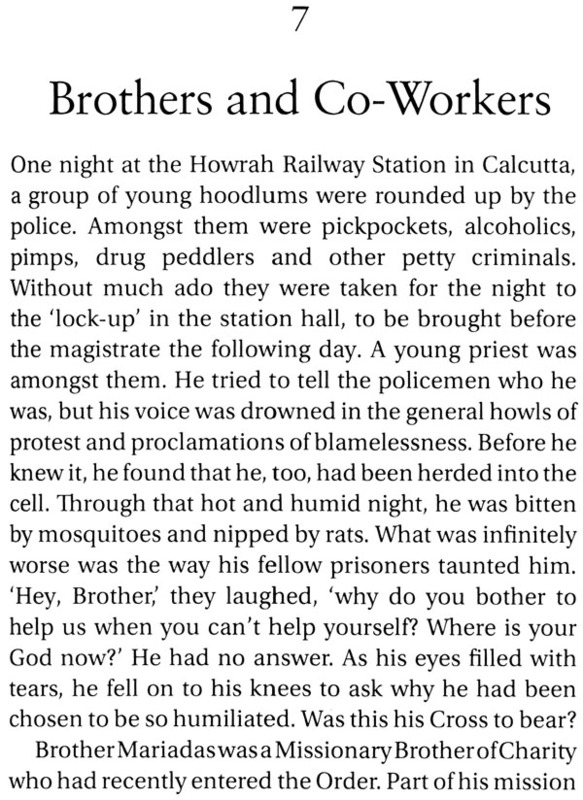 Customary cups of tea were brought in, but these Mother Teresa gently refused, explaining that the Sisters accepted no refreshments, from rich or poor. She spoke to the Lieutenant Governor about the special problems of those afflicted by leprosy. 'Their greatest suffering is that they are feared by all and wanted by none. My Sisters and I try to give them another life, a second life as it were. We have opened many treatment and rehabilitation centres in India. There they work in dignity. They do not have to beg. We are in very close touch with them, and give them tender loving care. We want them to feel that they are also loved! The Lieutenant Governor was deeply moved. He asked Mother Teresa how much land she required. 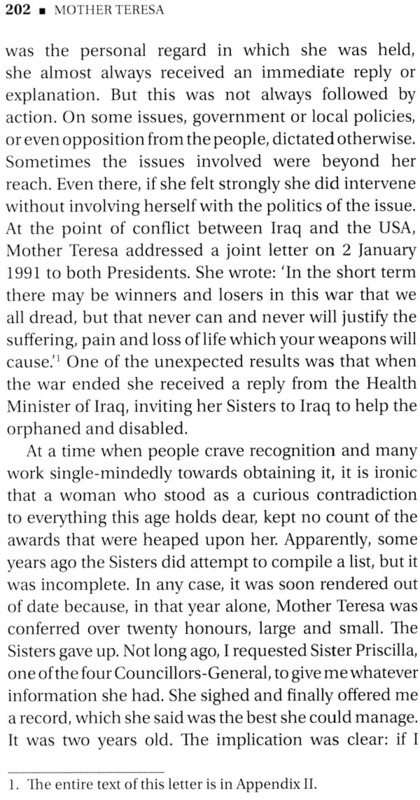 Mother Teresa, never a person to look a gift horse in the mouth, immediately sensed that victory was hers. With a delightfully childlike smile she promptly doubled the original estimate and asked for ten acres. The Lieutenant Governor instructed me to ensure that at least ten acres of land be handed over to the Missionaries of Charity for a leprosy centre in Delhi. In the half-hour that Mother Teresa sat in the Lieutenant Governor's chamber, I was able to observe her closely. Her face was deeply lined, even a little shrunken. Yet her diminutive frame only enhanced her obvious magnetism. Her brown eyes twinkled constantly. She appeared to be perceptive and remarkably practical. She could hardly be oblivious of the emotion she aroused in others, but she herself was cheerfully unsentimental. Her vocabulary was limited. She also said 'Thank God' a lot, not in any especially religious sense but as a kind of punctuation mark: 'It's a hot day, thank God; and 'I am glad I came, thank God: I observed that she wore her sari with grace, something few European women are able to do. 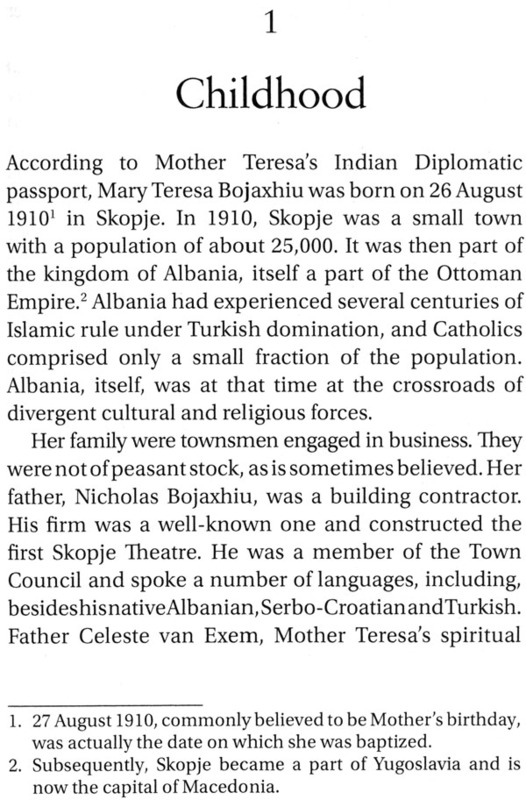 Mother Teresa, however, was hardly Albanian any longer. I knew that she had taken Indian citizenship soon after Independence in 1947 and that she spoke Bengali fluently. 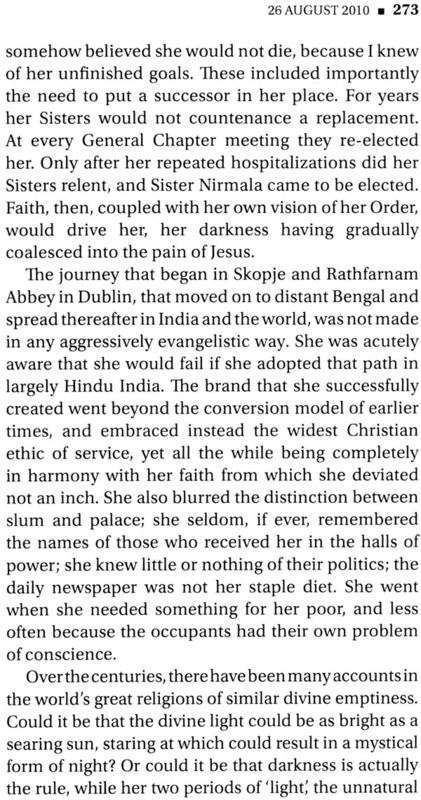 Long years of working in the slums of Calcutta and elsewhere in India had rendered her as Indian as anyone in her adopted country. It was her hands and her feet, however, that betrayed her arduous life. Her fingers were gnarled and twisted and her feet, encased in rough, ungainly sandals, were misshapen. Over the years I have often cast my mind back to that morning. What was it that had made it so special? Was that her self-effacing presence had scaled down the grand chamber in which we sat to her kind of ordinariness? Was it the sari, darned neatly in several places, or the old cloth bag with wooden handles which she carried that contributed to her sense of humility? Perhaps it was all this, as well as the enchantment that clung to her because she had lived so closely with her God.